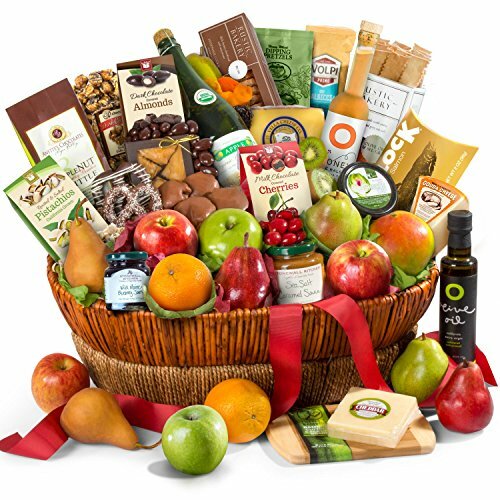 This abundant basket is brimming with fresh fruit and gourmet delights. This huge basket, one-of-a-kind basket includes 3 varieties of pears, 2 varieties of apples, oranges, kiwis, mango, 3 artisan cheeses, blueberry jam olive oil flatbread crackers, pistachios, dark chocolate sea salt caramel corn, dark chocolate almonds, triple nut bourbon brittle, baklava, chocolate caramel pecan clusters, pecan shortbread cookies, dry salami, olive oil, honey balsamic vinegar, dried fruit, salted caramel sauce, artichoke cheese dip, chocolate dipped pretzels, chocolate covered cherries, dipping pretzels, smoked salmon, a bamboo cutting board. To top it off - a bottle of organic apple cider for refreshment! Its ideal for office sharing or for a large family. All contents are presented in a large keepsake basket. Gift is delivered tied with a ribbon. Filled with an abundance of orchard favorite fresh fruits including pears, apples, oranges, mandarins, kiwis, and mango. Brimming with gourmet selections, including three Californian cheeses, crackers, salami, olive oil & vinegar, smoked salmon, artichoke cheese dip plus a bamboo cutting board. Favorites include dark chocolate sea salt caramel corn, triple nut bourbon brittle, caramel pecan clusters, shortbread cookies, salted caramel sauce, and chocolate dipped pretzels. Ideal for office sharing or a large family, this gift is beautifully presented in a large woven basket, and hand-tied with a ribbon.